For the unsophisticated tourist, Las Vegas seems to be nothing more than Sin City. Perhaps it is merely a decadent town where one can eat at a trendy restaurant, visit a night club where the DJ makes an obscene amount of money for a nightly performance, and the bar bill leaves the wallet famished. However, for the savvy visitor or resident, Vegas is a city teeming with talent. On any given night, you can listen to accomplished musicians with a lifetime of experience on the stage. In the glow of the neon, you may realize that this town was not only built on vice, it was also built on the American Songbook. 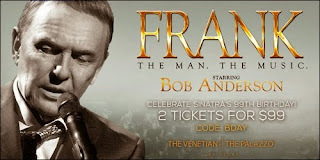 If you're visiting Vegas in the near future, I would suggest visiting the +Venetian/Palazzo Theater and seeing, +Frank. The man. The music. An amazing amount of work, planning, and production went into this show, which stars Mr. Bob Anderson backed by a thirty-two piece orchestra led by Vincent Falcone. It is noteworthy to mention that Mr. Anderson undergoes an elaborate make-up session to resemble Frank Sinatra. It is equally important to recognize that Mr. Falcone was Sinatra’s music director for ten years. The result is presentation of the Chairman's songs that considers the visuals, the horns, the strings, the percussion, the audience...everything is arranged so well. There are many highlights of this show that range from an intimate experience with Sinatra and the audience to the recreation of momentous moments of Sinatra’s career. Near the middle of the show, the house lights are brought down and Mr. Anderson ties the belt of his London Fog coat, and causally lights his cigarette. Under the stage light, it is just the piano, Mr. Anderson, a glass of scotch, and cigarette. It is a forlornly moment for Frank that the audience is allowed to witness. The songs that roll off the dark stage during this portion of the performance are only for the lonely. 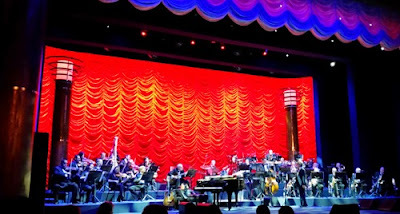 Then at other times of the show, the stage is bright and bustling as Mr. Anderson proudly describes Sinatra’s epic recordings at Capitol Records. The audience is given a rare treat as they recreate the Capitol recording sessions. Being a proverbial fly on the wall, you may feel as if you are witnessing Sinatra at work with the most talented musicians of the time. As the night continues, Mr. Anderson interprets the many years of Old Blue Eyes never losing his character as Frank. However, there is never the feeling that you are watching a campy impersonation. Reality may not be fully suspended--and to be fair I am not sure that was ever the intention of the production--but Mr. Anderson certainly takes you to some fairly lofty heights weaving Frank’s story with visual and aural experience. The importance of Sinatra’s contribution to music is profoundly conveyed in this production. When it comes to an end and the house lights go up, you realize that was an era of great sophistication in musical composition and performance. You might even be left with the feeling that we are missing something in entertainment and great music like that is fading into the noise of Electronic Dance Music. Thankfully, the Venetian/Palazzo did something to ease that haunting feeling. As you leave the theater, Ms. Laura Shaffer is sings with her band in the lounge. In my opinion, she is Vegas royalty, and she sings the songs of The Great American Songbook beautifully and skillfully. 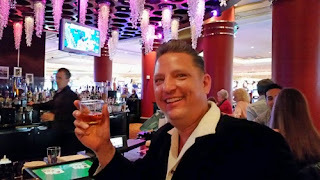 After listening, you can leave the casino knowing the songbook is alive and well. In fact, I think that is a great story for next time.